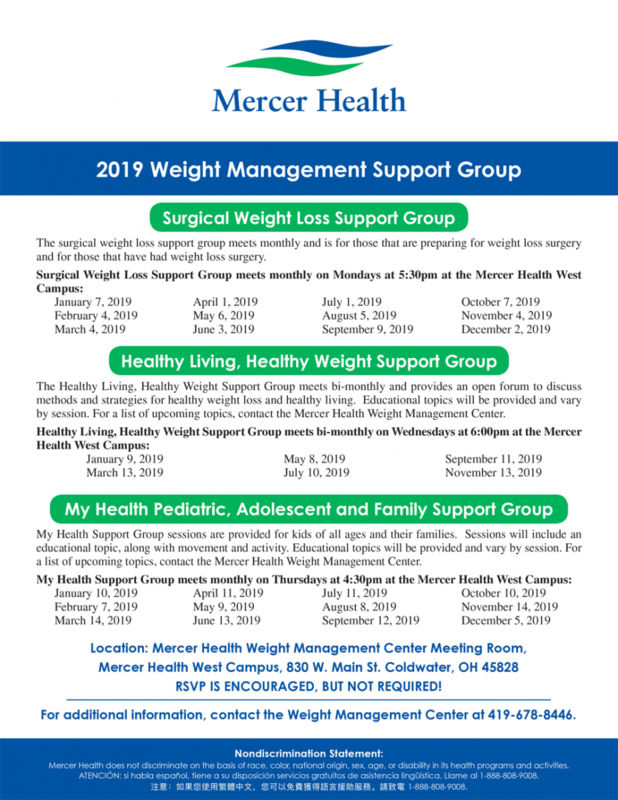 The Mercer Health Weight Management Center offers a variety of support groups to best meet the needs of our patients and the community. 1) Surgical Weight Loss Support Group: For those that are preparing for surgery or have undergone weight loss surgery. 2) Healthy Living, Healthy Weight Support Group: For those interested in learning methods and strategies for healthy weight loss and healthy living. 3) My Health Pediatric, Adolescent and Family Support Group: For kids of all ages and their families. For more information on these groups, as well as dates and times of support groups, please see the flyer below or contact the Weight Management Center. Team members from the Weight Management Center will be present at all support groups to help answer any questions, provide any needed support, and discuss a variety of topics. Share experiences and answer each other’s questions. Provide a safe and comfortable environment to share concerns and problems. Attend educational and social programs geared toward weight loss and weight loss surgery. Maintain long-term interaction with the multidisciplinary support team. Benefit from ongoing motivation and inspiration. For a list of upcoming topics and dates, contact the Weight Management Center at 419-678-8446.